At Oxford House, we care about the oral health of our patients, and understand just how important quality care is to the prevention of disease. Oral cancer is an issue that we hold very close to our hearts, as we have seen first hand the pain and distress it can cause to those afflicted by the disease, and their family members. To this end, we decided to hold a charity day in November last year, to raise awareness about the disease and raise vital funds for Mouth Cancer Action. 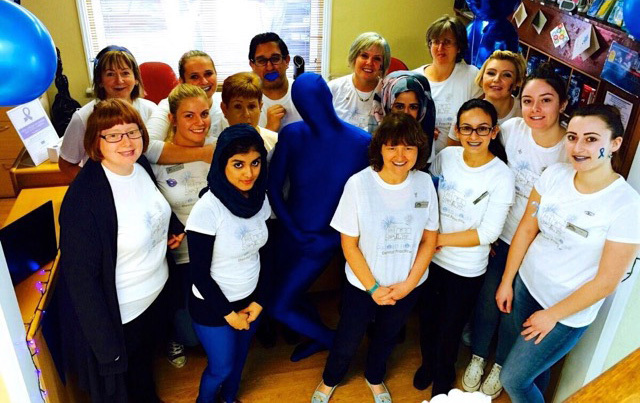 For one day only, we transformed our dental practice as we held a ‘Blue Up Oxford House’. We adorned the whole practice with blue fairy lights and decorations, whilst every member of staff wore a blue t-shirt made especially for the event. Throughout the day, we held a raffle with various prizes donated by our practice and generous local businesses. The event was warmly received by our staff, patients and the local community, and we managed to raise over £800 for Mouth Cancer Action. It was great fun for all involved, and a fantastic opportunity to educate our patients on the basics of oral cancer, its causes, and how to prevent it through sensible lifestyle choices. Our blue day coincided with Mouth Cancer Action Month, an annual campaign that encourages people across the UK to buy and wear a blue ribbon in support of the charity. If you missed the fun at Oxford House in November, or you want to get involved in the campaign, Mouth Cancer Action Month will be returning in 2016, culminating in ‘Blue Wednesday’ on the 16th of November. However, you shouldn’t think about your oral health for just one month of the year. Smoking, excessive consumption of alcohol, and poor oral hygiene are leading causes of oral cancer, and should be avoided to minimise the risk of health complications later in life. For more information about mouth cancer, and tailored advice on how to maintain your oral health and hygiene, please do not hesitate to contact our dental practice. Our team would be more than happy to answer any questions you may have.